Often, due to reasons such as driving, being stuck in meetings, causing disturbances to those around us or simply seeming rude, we find it difficult to pick up our phones or laptops to type out our memos to communicate. The post-millennial generation has discovered a solution to this dilemma where it will now be possible to send messages just with the use of tactile senses on spaces. Wouldn’t that be convenient? 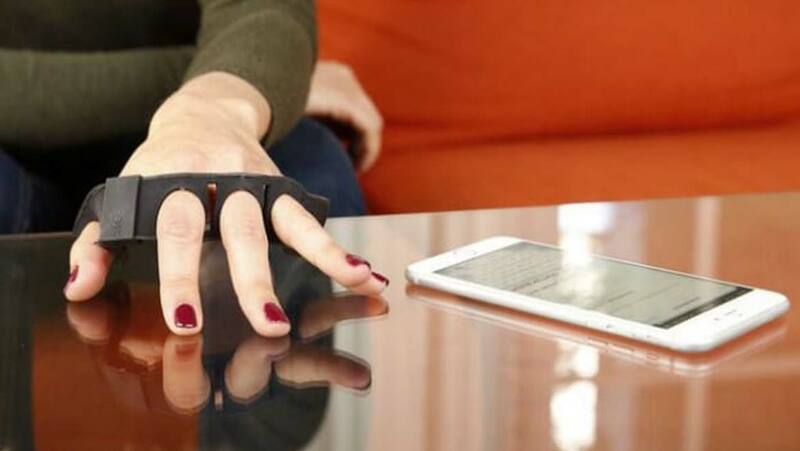 Introducing Tap Strap: a flexible, movement-sensitive keyboard made of a smart-material that can be wrapped around all the fingers of either hand with ease, as it fits like rings or fingerless gloves. Tap Strap helps you type on any available surface — tables, the floor, a book or your lap. This movements will in turn be relayed onto smart devices. The concept is simple in that each digit on the hand acts as a vowel and a combination of presses make the other letters, symbols, special signs and punctuations. Currently, there are 3 font sizes and 31 finger taps recognized by Tap Strap, one of these being three taps of the thumb to turn the machine on. This futuristic gadget is integrated with sensors and a control unit that transforms the mechanical input entered into commands and characters via bluetooth. There is a specialized application, TapGenius, which trains the user on gestures and speed. To start “tapping”, the app must be downloaded and an account created. Tap Strap is compatible with both iOS and Android systems on computers, smart TVs, phones and tablets with batteries lasting for four hours after a complete power up. Its features such as compactness, portability and privacy are alluring, although accuracy and user-friendliness are yet to be tested and perfected. At the exponential rate that tech developments are being made, we’ll soon be saying goodbye to voice control and QWERTY, and welcoming virtual keyboards such as Tap Strap. Orders are currently being taken on a waiting list, with the Tap Strap priced at about $120. If you love communicating on the go, then this is one contraption to watch out for! Top image: Demonstration of the Tap Strap. Image Source: Tap Systems, Inc.